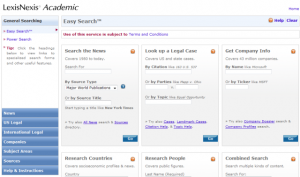 Accented with a cool blue color scheme, “Lexis-Nexis Academic” now offers five easy templates for finding its most sought after content: news, legal cases and research on companies, countries and people. For in-depth research, the left-hand navigation bars expand to provide detailed search categories. Probably the biggest challenge “Lexis-Nexis Academic” users face is choosing the right file or silo to search for the information they need. This is largely due to the complexity and wide range of sources offered by Lexis-Nexis. With this latest interface design, the Easy Search, Power Search and Source Browse and Find features should make searching Lexis-Nexis Academic easier than ever for the Google generation. The valuable content available via Lexis-Nexis hasn’t changed, though. Lexis-Nexis’ “US Legal” section is the best place to look for analysis of the law in “Am Jur 2nd” (a premier legal encyclopedia), scholarly legal articles (called law reviews), and THE law found in state and federal court decisions, statutes and administrative regulations. Lexis-Nexis’ “News” section is almost entirely text, lacking the media and images we’ve become accustomed to on the free Web and in other library databases. News is conveniently bundled: files for foreign language news, transcripts of radio and television programs, articles about business and industry, traditional regional print publications and web blogs. Lexis-Nexis’ “Companies” section brings together business directories for public private and international firms crated by reliable providers such as Hoovers, ICC, Extel, Disclosure and S&P. Accounting, taxation and environmental regulation are subject areas of strength for Lexis-Nexis. Lexis-Nexis Academic may be accessed from our Databases A-Z page.